Why Plant Biology at Illinois? The Department of Plant Biology is one of the oldest academic units at the University of Illinois. The department was established in 1901, and the first PhD degree was conferred in 1909. The department has historical strengths in plant physiology, particularly photosynthesis research, enhanced by the presence of the USDA ARS Global Change and Photosynthesis Research group on campus, as well as in paleobotany, plant systematics, and ecology. 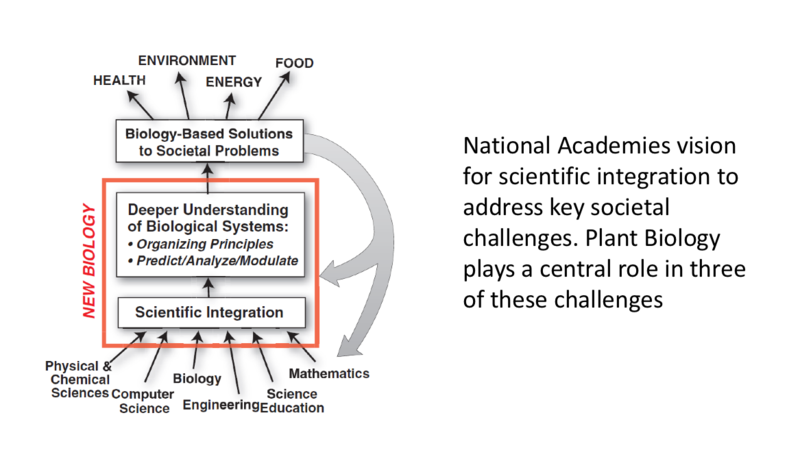 Our mission is to conduct basic and translational research and training in plant biology that integrates across temporal scales and levels of biological organization. We occupy a unique position on campus – as the only department that explores the biology of plants from the biochemical and molecular to the ecosystem scale. Our faculty self-identify research interests in one or more of four categories: (i) ecology and climate change; (ii) physiology and development; (iii) biochemistry and genetics; (iv) systematics and evolution. 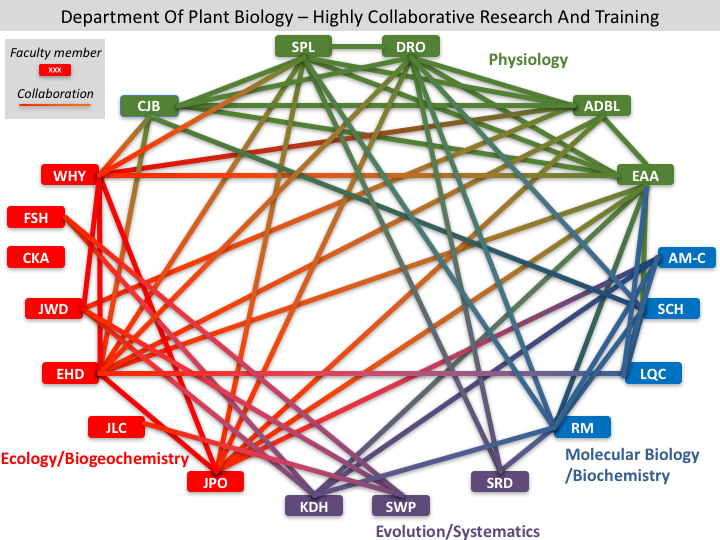 Despite these disciplinary differences, the breadth and overlap in the areas of expertise within our department results in a highly inclusive network of collaborations. 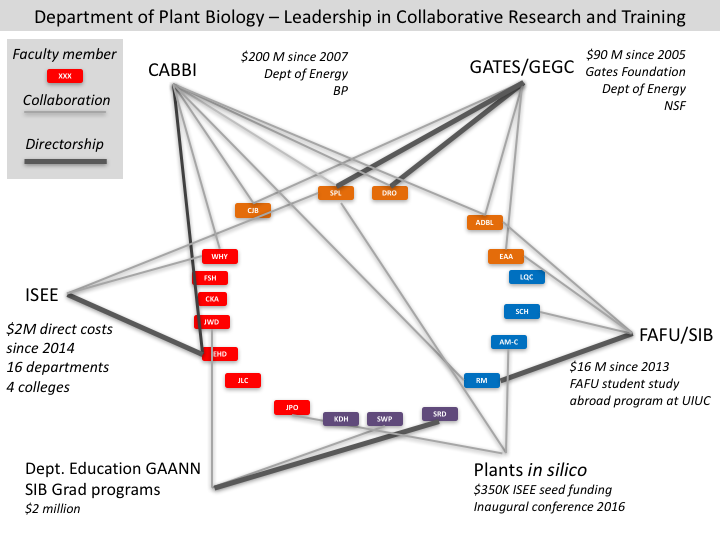 These collaborations across sub-disciplines, represented as links in the tanglegram below, highlight how Plant Biology faculty successfully conduct integrative research, and cooperate to address questions across multiple scales of organization. Beyond our department, Plant Biology faculty provide leadership for an array of research and training initiatives across campus. These include the Genomic Ecology of Global Change (GEGC) theme in the Institute of Genomic Biology (Don Ort, theme leader; 6 of 7 theme members in Plant Biology), which explores how environmental and biotic stress associated with global change impacts gene expression, metabolomes, and scales to impact ecosystem function, the Gates Foundation RIPE project led by Steve Long, which is an international consortium of plant scientists working to engineer more efficient photosynthesis so as to increase crop yields for staple food crops in grown in Asia and Sub-Saharan Africa, and the Center for Advanced Bioenergy and Bioproducts Innovation (CABBI), a new $115M initiative led by Evan DeLucia and funded by the Department of Energy to generate sustainable and cost-effective biofuels and bioproducts. Our department also offers fellowship support for eligible graduate students through our Department of Education Graduate Assistantships in Areas of National Need (GAANN) grant directed by Stephen Downie. Additional fellowship opportunities for Plant Biology graduate students are listed in the financial support section of our graduate handbook. Finally, we also host a study-abroad program for international visiting students. This program brings students in their junior or senior year of undergraduate study to Illinois for a one-year program of study. During the first semester visiting students join a research lab and take selection of upper-level classes offered or cross-listed by the School of Integrative Biology. In the second semester visiting students complete a semester-long research project mentored by a faculty member, postdoc or senior graduate student in the lab. Throughout the program, students are mentored by our study-abroad program coordinator with a dedicated course providing a foundation to scientific research skills. While our study-abroad program is currently primarily directed to students from the Fujian Agriculture and Forestry University (FAFU) we also welcome enquiries from interested students from other institutions.